This novel by the New York Times bestselling "master of alternate history" explores an America reshaped by a twist in prehistoric evolution (Publishers Weekly). What if mankind's "missing link," the apelike Homo erectus, had survived to dominate a North American continent where woolly mammoths and saber-toothed tigers still prowled, while the more advanced Homo sapiens built their civilizations elsewhere? Now imagine that the Europeans arriving in the New World had chanced on these primitive creatures and seized the opportunity to establish a hierarchy in which the sapiens were masters and the "sims" were their slaves. This is the premise that drives the incomparable Harry Turtledove's A Different Flesh. The acclaimed Hugo Award winner creates an alternate America that spans three hundred years of invented history. 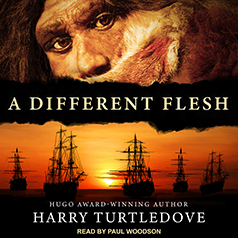 From the Jamestown colonists' desperate hunt for a human infant kidnapped by a local sim tribe, to a late-eighteenth-century contest between a newfangled steam-engine train and the popular hairy-elephant-pulled model, to the sim-rights activists' daring 1988 rescue of an unfortunate biped named Matt who's being used for animal experimentation, Turtledove turns our world inside out in a remarkable science fiction masterwork that explores what it truly means to be human.